The X1 Lightweight Transit Wheelchair has an array of features to make it one of the most practical, comfortable and reliable occasional use wheelchairs available. Aluminium frame with metallic silver finish. 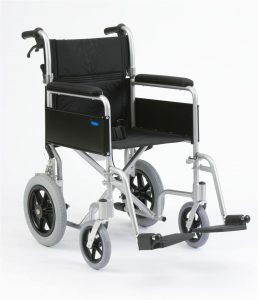 The entry level lightweight aluminium X1 Lightweight Transit Wheelchair is both light in weight and on your pocket. At just over 8kg with wheels removed. 12 1/4″ Transit grey solid tyres. This lightweight wheelchair is brought to you from industry leading manufacturers ‘drive’ and chosen for those who are seeking a lightweight, compact and comfortable wheelchair all at an exceptional price point.